I have recently acquired a new relative - a “long lost cousin,” if you will. I’ve known of her and her family my whole life, but never actually met her due to matters of geography. Now that we are both living in DC, we’ve started hanging out and found that we actually have a lot in common! Some things are just coincidences – like the fact that we both frequent foreign films and stalk the Smithsonian website. Some things have got to be family related – like that we both grew up eating dessert every night, not right after dinner, but a little while later in the evening. We’ve both seen our moms fret over pie crust (“Why are you cracking? Don’t crack! Don’t crack? Oh no no no no no!”), and we are in the process of confirming that we follow the same amazing zucchini bread recipe. As you can probably tell, this post is obviously headed in the dessert direction. Within a day of meeting each other, we were already talking dessert – recipes, cake blogs, etc. So on Sunday when she asked me what I’ve been baking, I was embarrassed to admit that I had been suffering from a lack of creativity! This cake is fantastic! It just slightly banana-y, and really light and airy. And the recipe makes a lot of cake! I made two thick layers, and cut one in half to make it a 3-layer cake. I put chopped walnuts and mini chocolate chips between the layers (because I have this philosophy that MOST desserts are improved by chocolate and nuts). I think the brown sugar frosting was a bit too much. I didn’t exactly follow the recipe, because I don’t like really buttery buttercream. (My friend Erin is reeling with the blasphemy of that statement!) But I did melt brown sugar and butter together (you have to, otherwise it will be grainy), and then beat in powdered sugar and a bit of milk until it was the right consistency. It tastes good, but kind of overpowers the light cake and the mild banana flavor. I think in the future, I will make a lighter vanilla frosting, or maybe add a bit of maple syrup or extract (or maybe molasses) to get that brown sugar taste. 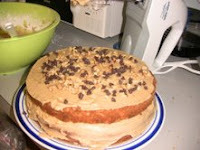 As the frosting cooled, it became harder to spread – it stopped sticking to the cake! So the sides look kind of messed up. But overall D-E-LICIOUS! I think my housemates (who regularly benefit from my baking ventures), and my cousin will agree. Especially with a bit of vanilla ice cream! In a separate bowl, combine the dry ingredients -- flour, baking powder, baking soda and salt -- and whisk thoroughly. You'll want the baking soda to be well distributed throughout the flour before adding to the wet ingredients. Alternate adding dry and wet ingredients (milk), beating each time until it is just incorporated. Start and end with dry. When you're done, you should have a nice, soft, fluffy batter. Stir the milk and flour together and mix over medium heat for 5-10 minutes, until it thickens. It changes suddenly, so don't walk away from it. Set the milk aside to cool, and combine the sugar, butter and vanilla in a mixer. Beat on medium speed for 5-10 minutes -- colder butter will take longer -- until the sugar is dissolved and you don't taste the graniness of it any more.